Journal of Sexual and Reproductive Medicine is a quarterly, open-access, peer reviewed journal providing an international platform to publish eminent research work from all over the world by renowned research scholars, therefore aiding in enhancing the quality of the journal. 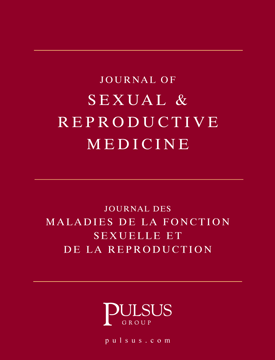 The Journal comprises of original research articles, clinical studies, case reports, review articles describing a broad range of topics including gynaecology and obstetrics, human reproductive health, all gynaecologic and male reproductive cancers, male and female reproductive diseases, recent reproductive technologies, sexual health, sexual dysfunction, erectile dysfunction, sexually transmitted diseases, reproductive medicine, sexual medicine. The journal follows stringent peer-review process only after which an article is accepted for publication.